Nonna doesn’t use a lot of prawns in her cooking, they’re not used much in her region, fortunately we have friends that do it right. A few Saturday’s ago, our friends had us over for a BBQ lunch. He had been to the fish market that morning and bought an array of fresh seafood. He was most excited about the huge jumbo prawns he got. Now, before I continue, In Australia we do not call them shrimp. Shrimp are the teeny tiny ones that we have in dishes like fried rice. 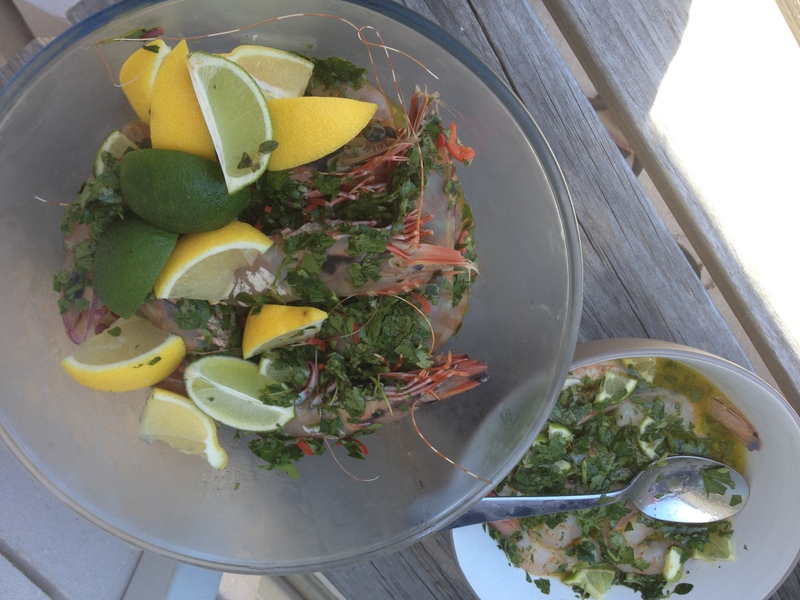 Prawns are usually at least the length of your index finger – sweet and juicy. They are versatile crustaceans and used in many dishes in different ways – deep fried, grilled, sauteed in garlic, honey, salt and pepper, laksa, spaghetti, salad – the list goes on. There are many varieties of prawns you can eat ‘natural’ and have their own unique taste. Tiger, which have an exquisite nuttiness, Banana, with there yellow tints and black tail are great for adding flavour to, King Prawns, great meatiness, salty and perfect natural or with a cocktail sauce. 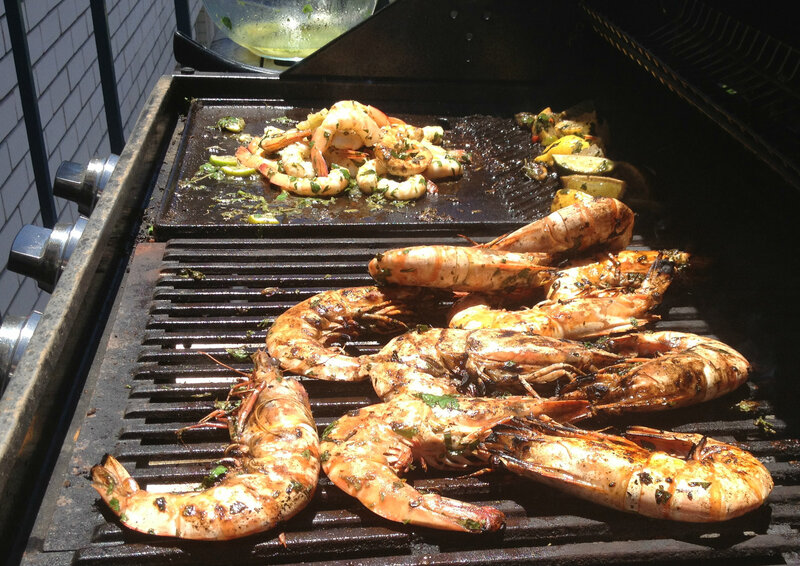 Yes prawns have varying degrees of saltiness, sweetness and smokiness. But my all time favourite way to have them is chargrilled on the BBQ and there’s no other way to eat them but with your hands – the classic fingerbowl invented for such delights. There is such a simple pleasure in the way you peel and eat a prawn. The warm juices running through your fingers and trying to find the patience to wait until they have cooled down to peel them is very difficult. Snap and twist the head, trying to pull the shell off in one continuous rip, gracefully remove the poo tube, hold it by the tail and bite! It does sound a little gruesome, but you will know what I’m talking about if you have had the pleasure of doing it before. Our friend had marinated them overnight in chilli, lemon, lime a few herbs and fried them up on the bbq. They were delicious. Their subtle chargrilled smokiness and lemony, sweet tang with a warm hum of chilli was exquisite. We sat on his balcony all day feasting on all of the seafood and soaking up the warm sun. A perfect summer lunch, washed down with some ice cold beers. I hope there are a few more warm sultry days with a cool breeze left before Autumn comes too quickly. This entry was posted in Places, Tried and tasted, Voilà by wordofthenonna. Bookmark the permalink.